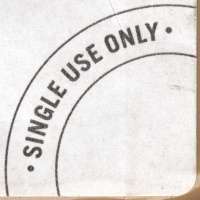 A denotes the service type which was for Airmail. At Europhilex 2015, as is usual with International Exhibitions in London, as well as the usual Royal Mail ‘Philatelic’ offering, an operational Post Office was established on the gallery. 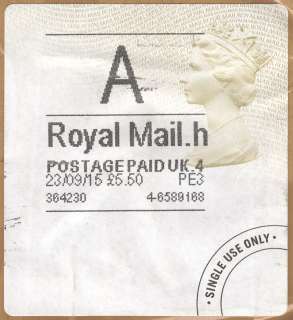 As part of this and similar to London 2010 where the now widespread ‘Gold’ Horizon had its ‘First Day’ , Post Office Ltd introduced the latest updated design of Postage Label, with reduced size Queens Head (to allow for more information to be printed) and change to a colour more reminiscent of ‘2000 New Millennium Definitive’ Machin stamp (issued on 6 January 2000). The first day of use (and therefore introduction of the base label) was 13th May 2015. This is believed to be followed by a limited use in selected branches in the following weeks. As can be seen, as well as the change of colour, the design features a reduced size Queens Head (Previously announced by Royal Mail at the BPMA Friends Open Day at Debden a year ago on 17th May 2014) and a ‘precancel’ to serve as a reminder that items bearing labels cannot be reused, even though they are not routinely postmarked or cancelled. 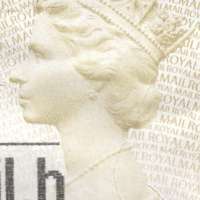 The increased ‘white space’ is understood to be made available for a future change in the overprint itself.